For the 9th Pokemon movie Pokemon Ranger and the Prince of the Sea: Manaphy (ポケモンレンジャーと蒼海の王子 マナフィ) in Japan or Pokemon Ranger and the Temple of the Sea in USA, only one bottlecap figure was released. 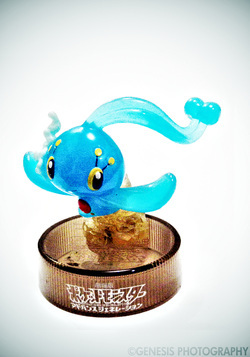 A special clear figure of Manaphy was released as a bottlecap figure in 7-11 stores in Japan as part of the promotion for the movie. Manaphy is one of the first bottlecap figures in my collection alongside Plusle and Munchlax. It was found in a toy store near me. It was thrilling to know that there are more figures like the Pikachu bottlecap I found. It is the only figure released for this set and is quite unique. It is completely different from its 10th Anniversary counterpart as it is of a different mold and is made of a clear material.